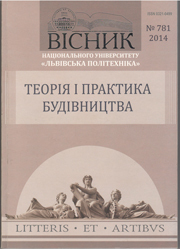 The results of completed scientific research in the construction industry of the teaching staff of the Lviv Polytechnic National University, ukrainian and foreign scientists was published in this series. All articles received by the editorial board, necessarily are reviewed. Additionally the editorial board uses Similarity Check System's developed by Unicheck.com in order to ensure that the content published is original.